Delhi chief minister Arvind Kejriwal should first make the complete cost to Punjab for the water his state had been receiving for all these years before coming to Punjab to solicit support for his party Aam Aadmi Party (AAP).In a statement issued here today, Punjab revenue minister Bikram Singh Majithia said that in pursuance of the resolution adopted by Punjab assembly, Kejriwal should immediately respond by honouring the resolution by releasing the entire cost due to Punjab immediately. Majithia said that Kejriwal on his visit to state had stated that there was no spare water with Punjab to share with neighdbouring states of Haryana or Rajasthan but reaching Delhi he had a dramatic volte face when he took a didametrically opposed stance.Punjab revenue minister said that AAP Punjab convener Gurpreet Singh Ghughi should organize a ‘morcha’ at the residence of Delhi CM and lift it only when he releases the entire cost of water to Punjab. Since the APP morcha at Kapoori has turned into a flop show as people failed to turn up as they were already fed up with AAP gimmicks, Ghughi and his ilk can take a flight to Delhi and stage a morcha to get restored their partially albeit credibility. It is strange that Kejriwal would make one statement while in Punjab and change his stance on reaching Delhi, said Majithia arguing that how could Punjab accept Kejrial on his words. 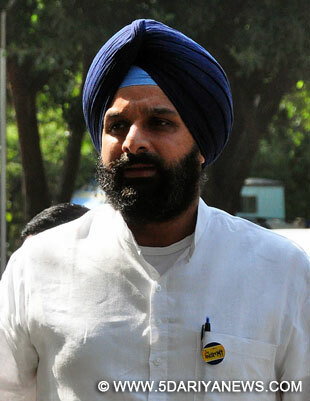 Such a flickering person is not at all acceptable to Punjabis as his first loyalty is to Delhi and second to Haryana, his home state, he added.Equally shocking was the AAP demand for “status quo” on SYL for the next three months articulated by “ Ghugghi” while meeting Punjab governor BP Singh Badnore yesterday, averred Majithia adding that the argument offered for maintaining status quo was totally bizarre and preposterous. Ghuggj had urged the governor not to disturb the status quo as it may whip up emotions throwing the state into vortex of violence. The avowed objective of AAP and Ghughi is clear that Punjab, like APP supremo Kejariwal, should do nothing and put the burning issue of SYL on back burner.“ Kejriwal and his team are traitors of Punjab and won’t like to commit to the interests of the state at this crucial juncture and are withholding their real intent, ”, said Majithia exhorting people to pack the AAP lock stock and barrel and dispatch them to Delhi.Interestingly, Kejriwal had adopted a stoic silence since the Supreme Court announced its verdict on presidential reference last week while the entire state was totally exercised over it and was expecting that all the political parties would speak with one voice.